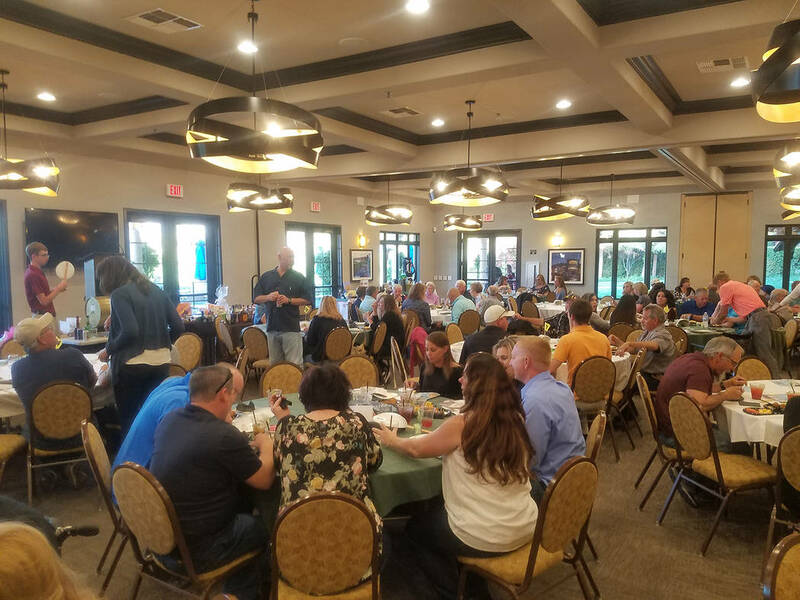 Over the past 23 years, the Pahrump Valley Youth Golf Founders Club has raised more than $200,000 through its annual Quarter Auction, and this year’s edition is slated for April 13 at Mountain Falls Golf Course. David Jacobs/Pahrump Valley Times Some of the items for the 2018 Quarter Auction to benefit the Pahrump Valley Youth Golf Founders Club on display in the Grill Room at Mountain Falls Golf Club. David Jacobs/Pahrump Valley Times The crowd gathers in the Mountain Falls Golf Club Grill Room for the annual Quarter Auction, held April 14, 2018, in Pahrump. Funds raised from past auctions have been used to provide college scholarships, to promote and support the Pahrump Valley Junior Golf Association, to defray travel expenses for Pahrump Valley High School golf teams, to purchase equipment for the middle school golf program, to conduct school tournaments, to purchase golf bags and anything else needed by youth golfers in the area. Presently, there are more than 200 student golfers between the school and junior programs in Pahrump. The quarter auction is not technically an auction. Ticket holders will be given an auction number upon entry. The auctioneer will draw a number at random for each available item, and the matching number wins that item. Dozens of items have been donated for the auction; last year the total was 160. 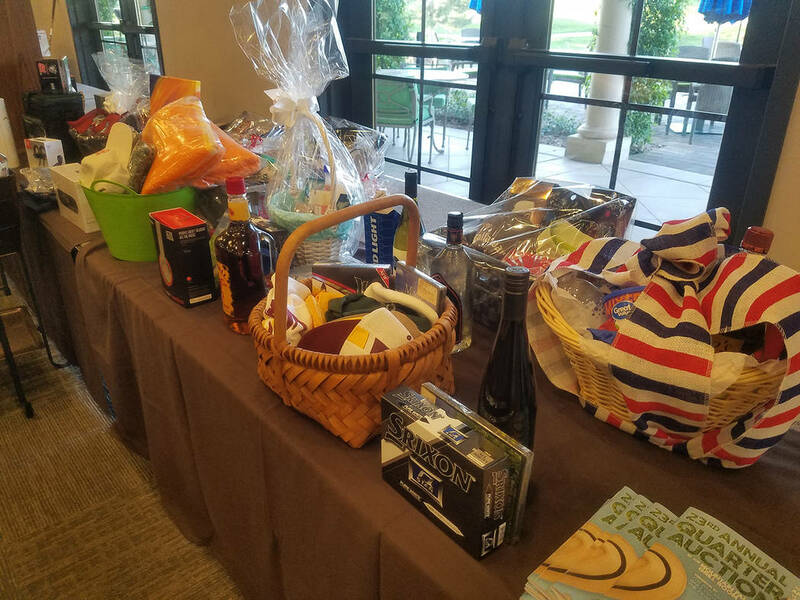 Along with the usual rounds of golf for four at places such as Boulder Creek in Boulder City, Highland Falls, Spanish Trails and Bear’s Best in Las Vegas, there will be gift baskets, gift certificates and cash. Specialty items will come up during the auction as well, such as national and state flags that were flown over the state capitol, donated by former Assemblyman James Oscarson, a vase donated by Pahrump Valley Pottery and a digital safe donated by Farmers Insurance. Last year, ticket sales went beyond the soft capacity of 200, as the bar area at the Mountain Falls Golf Course’s Grill Room was opened to accommodate the crowd. Tickets are priced at $60. Hors d’oeuvres will be served at 6 p.m., with the auction scheduled for 7 p.m.